My husband has been politely reminding me to get my sewing room cleaned up for quite some time. Why does he care what my sewing room looks like, you ask? 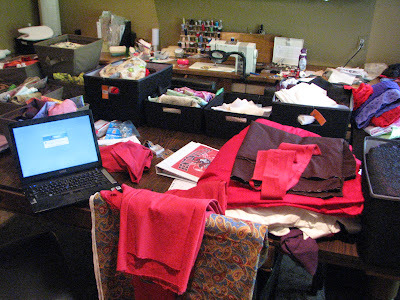 Well, because my sewing room is actually our dining room! It is really a nice place to work: it has great natural light, it's near the kitchen, and the table quickly expands to 96". Unfortunately, I also tend to pile my fabric and patterns and tools on it, too. So I agree, it can be quite messy. Several years ago, we realized that we rarely used the dining room and my husband had the idea to convert it to a "craft" space for the kids and me. A few friends (including real estate agents) warned us not to do it, but we had no intentions of selling in the near future. We added some built-in cabinetry to house the supplies, as well as a pop-up mechanism for my sewing machine, so we can quickly hide it when we do use the room for dining. In theory, it would work as both a formal entertaining space and a sewing studio. In practice, I have taken over the entire space with my various projects and the cabinets are over-flowing with fabrics and patterns and notions, and things are rarely put out-of-sight. Sometimes, I start a second (or fifth) project before cleaning up the previous project(s). I'm just not very organized. So I began by pulling out the contents of the cabinets, piling it on the table and started sorting through it. In order to get a better idea of what I was storing, I measured the fabric and cataloged everything. Even after throwing out the smaller, unusable pieces, I have over 80 fabrics in my stash! Most of the fabric is left-over from previous projects, but 35 pieces are at least a yard in length, and 20 pieces are completely unused. Before my clean-up, I had no idea that I had a hoarding problem. Okay, I knew I had a hoarding problem, now I recognize the extent of it. I have sworn off purchasing any more fabric until I've worked through some of the stockpile. The cataloging slowed the process a bit, but after seeing how much fabric can be stuffed into the cabinets, I wanted to have the inventory information at my fingertips, mainly so I can avoid any future impulse to run out and buy more fabric (at least until I've worked through most of this). It's a simple Excel spreadsheet, making it easy to filter by color, content, size, etc., so in theory, it should be quite useful for me to find a fabric quickly. We shall see. I now have a lot more space for storage and I know where everything resides (or is supposed to reside). I even set myself up with a little system where I have a fabric storage bin to hold everything I need for the current project (assuming there is only one), and it's easily stored during any hiatus in sewing or for entertaining dinner guests. It sounds good, in theory.